I still remember the day I received the message. 7:56pm on Halloween Day of 2016. A short note from my training partner and best friend, Annette Kozlowski. 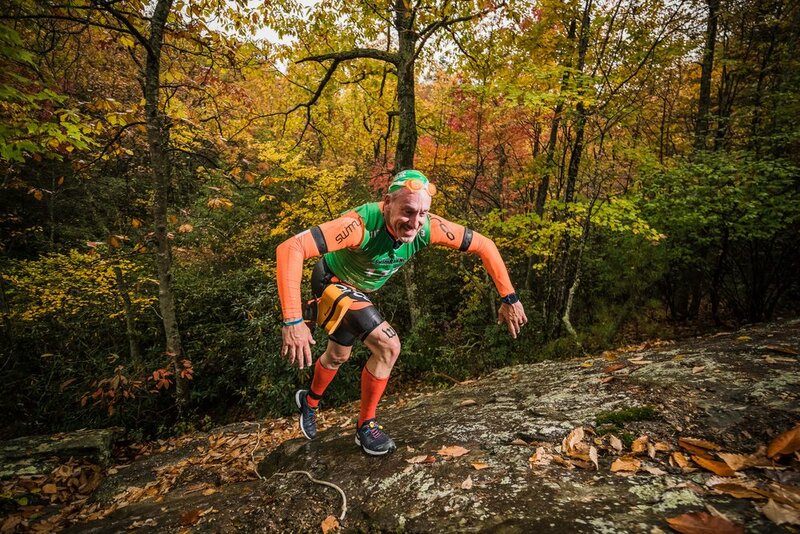 It simply said, “Looks tough!” and included a link to a SlowTwitch story by Herbert Krabel about SwimRun North Carolina. The story was amazing. The pictures, gorgeous and inspiring. 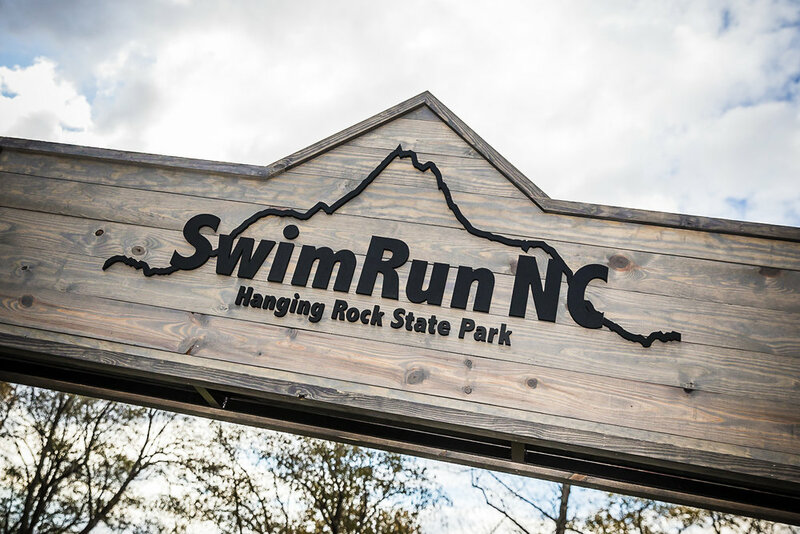 The inaugural SwimRun NC brought 52 teams of 2 from across the country to Hanging Rock State Park to tackle a beautiful and very challenging course. 14.3 miles of running up and down a mountain, through waterfalls and crossing creeks and 1.8 miles of swimming split up into 11 runs and 9 swims in a unique ÖTILLÖ inspired SwimRun format. And the 2017 edition promised to be even more challenging with a world class field of athletes expected to top 100 teams. So with about a month away from the official race application opening I emailed the race director, Herbert Krabel and inquired about the process. I discovered that unlike marathons, triathlon or even Ironman, SwimRun doesn’t allow competitors to simply ‘sign up.’ We would need to submit an application on December 1st and our race history would be evaluated. Questions like, had we completed long distance open water swims? What length races had we traversed? How long did it take us to finish an Ironman? And so on. All of this meant to ensure that the teams – yes you race as teams, tethered together – are all competitive and can complete the race. In the time between that exchange with Herbert and December 1st we prepared our application and race resumes. And we did some investigation on SwimRun. The sport, established in 2006, began as a drunken bet between Swedes to swim and run across the islands in Stockholm's archipelago. Their inebriated scheme became known as the ÖTILLÖ (Swedish for "island to island"), a gruelling 6.1 miles of open-water swimming and 40.3 miles of trail running interspersed among 26 archipelago islands—completed while tethered to a partner. Watching the videos and looking at the pictures from events like ÖTILLÖ and Breca SwimRun was infectious. The race locations didn’t look anything like what we were used to with marathons or Ironman. These locales were wild, untamed – some looked downright menacing! But every person we saw had these amazing smiles on their faces. And as we watched we soon began to realise the equipment for this sport was much different too. Unlike a triathlon, which transitions from swim to bike to run -- once, Swimrun alternates between running and swimming – over and over again -- and requires its own unique set of gear. For efficiency, you run in a special Swimrun wetsuit that's just the right thickness so you stay warm in the water, yet don't overheat running, and you swim in your socks and sneakers, which should be lightweight and fast-drying. Many people wear tether belts to allow the racers to stay close together and paddles on their hands to allow more strength in the swim portion – the only catch, everything that crosses the start line must make it with you across the finish line. All of this new gear, type of racing and experience could have been difficult to assimilate but after our acceptance on December 2nd, Herbert was an amazing steward of the sport and guided us each step of the way. He also met us many times at Hanging Rock and took us through the gear, the course, talked about the preparation and how to tackle the climbs, descents, cold lake swims and of course the final swim down the Dan River. Over the next 10 months we assembled all the gear: INOV8 shoes and GoCoCo sock combination that allow them to drain quickly and keep your feet dry even after an hour of swimming. Orca wetsuits. Swimrunners buoys, tethers, compass and safety wrap. And Roka goggles. And, we trained very hard for the event. Along the way we also completed several other races including: NYC Triathlon, Escape from Alcatraz and Ironman Louisville -- 2 weeks before the event. I mention that simply to say none of those epic events came close to the out of the world experience at SwimRunNC. As a side note, I would not suggest doing an Ironman event before a swimrun. So in the midst of recovery from a gruelling Ironman Louisville, Annette and I made our way to Hanging Rock – Green Heron Ale House the afternoon before the race. There on the banks of the picturesque Dan River we showed the race directors that we had legal wetsuits and a medical compress bandage in case of an injury. We then picked up our race bibs, some great race swag and the sweetest letters of encouragement ever – written by some local elementary school kids. The environment was formidable. The crowd looks seasoned with several pros in attendance. I think Annette and I felt a bit out of place that afternoon. A little unsure if we were meant to be there. But everyone was so friendly and we aren’t quitters and pressed on! During the race briefing the directors reminded us of the rules including the one about trash. There is no littering in SwimRun and that’s a very good thing. A participant can be disqualified if they leave anything (e.g., drink cups, gel packets, banana peels, clothes, etc.) on the race course. The other thing that was made clear – this is a race but you help each other. The course can be dangerous. If you see someone hurt – you stop and provide aid. You Give people a hand. Seems a bit spiritual and it makes the event unlike anything else you’ll do in your life. The next morning, we arrived (very early) at the race under the cover of darkness and attempted to sleep in the car to no avail. Added bonus, we were met with rain and temperatures on the cool side and dropping. Finally time to get out of the car and get dressed. A complete adventure assembling al the gear and making sure we had everything for the ½ day race. In the process my race belt connector broke and I hurriedly tied it together. Quite spectacularly it held all day – so well in fact that I had to cut it off at the end of the day. In a flash we were staged in the starting corral with the other teams and the gun went off. We were soon jockeying for position as the teams made their way away from Green Heron up the access road that led to the first series of trails up Hanging Rock lower section. 4/5 miles of rocks, smiles, giggles, stumps, rain, climbing, howdy’s, crossing rivers and traversing beautiful waterfalls later we reached the midway point and the lake. We needed to make 2 passes through the lake for the first circuit. After the 500m+ swim we exited, immediately started to freeze – warmed a little running and then back in the water for another 25m swim before traversing down and up the other side of the dam. Then….. we had to do it again. The water was literally so cold I lost my mind. I didn’t want to go back in – pretty sure neither one of us did. But that’s one of the most beautiful parts about SwimRun. You have a partner. And when one of you feels down, scared or like you don’t want to get in the cold water, the other team mate is there to pull you. In this case, the second loop of the swim, Annette dove right in and I had to follow. And after another pass through the lake we continued on, climbing 642 slippery stairs to the top of Hanging Rock and one of the most beautiful views ever. Then back down the other side for another two crossings of the lake. And out of the lake for the final time and a handful of genuine German gummy bears, we started down the final portion of the trail to the bottom of the mountain. We were beat up, tired and the temperatures were extremely cold – but we were smiling. IN fact every single picture of us that day – we were smiling. Near the last aid station our hands shook so much from the cold we could barely unwrap the chocolate bars. But we managed – took in the delicious snack, a quick pit stop and off. Cold and relieved to be so close to the finish line we entered the Dan River together, and swam down the final 800 meters of the rapid-filled river, climbed a dozen stairs, and ran the remaining 50 yards, side by side, to cross the finish line with frozen smiles. It had taken us 5 hours and 27 minutes, but we did together, and that is what makes the Swimrun so special. We were far from first place, even in our division, but we certainly weren't last. We sipped victory beers and enjoyed some warm food surrounded by a room full of extraordinary people that felt like family. The best of friends, I realised, challenge us to do things we would never have the confidence to do on our own. We agreed on the spot we’d never do that race again. However within the next 7 days we changed our mind and not only signed up for SwimRunNC 2018 but 3 other events too! From a simple message to our MaybeSo team being 99th in the world in SwimRun ranking. Quite a journey – side by side- together. Tethered for Life. Annette is an educational leader in health, sports and fitness and a founder of SwimRunEndurance, an adventure and endurance training company. 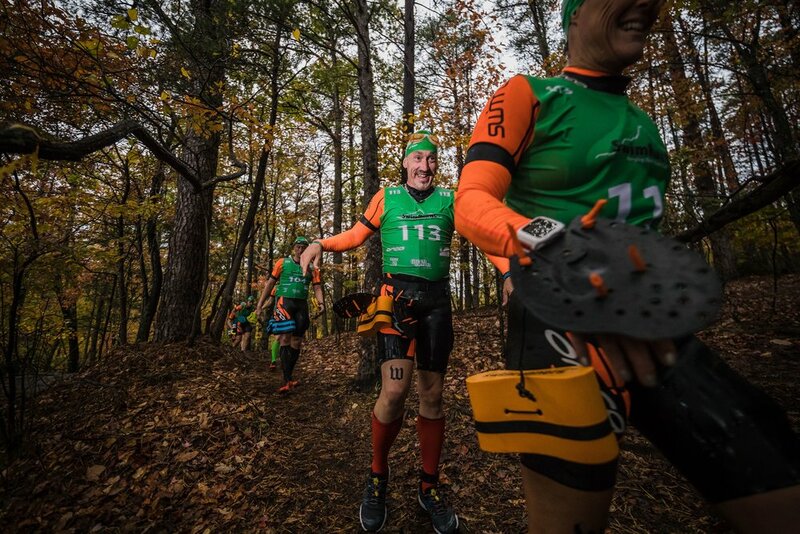 She and her partner, Jeff will compete as “Team Maybe So” at several SwimRun events in the United States including the IGNITE SwimRun National Championship and the Casco Bay and SwimRunNC ÖTILLO merit races. They are currently evaluating international Breca SwimRun events for late 2018 and 2019. Jeff is CEO of a NYC based security company.